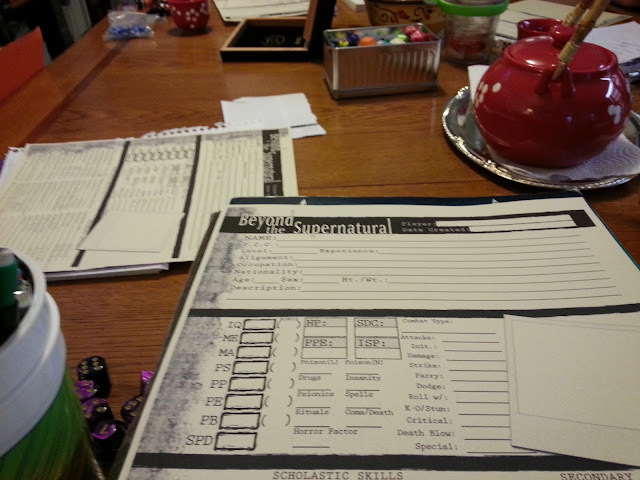 This session saw four monster hunters go in search of a fellow hunter who'd gone missing: Fred Carter. While on Carter's trail, they've traveled over most of the continental U.S., gotten into a melee with a couple of alligator-men, and were nearly blown up. When we left them, they had just come under attack by even more gator-men. The team's currently split up, battered, singed, and possibly outnumbered by upright-walking gators who can use weapons and are extremely hard to kill. Are you using 1st or 2nd edition BTS? I always liked the idea of the 'Victims' game in the 1st edition and wished they had expanded on it. It has been a long time since I've played BTS. The closest that I came to recently was running Wujcik's 'The Randolph Family Mansion' using Risus as a solo scenario for my wife. I'm totally a first edition guy - second edition had promise, but the fact that they left us hanging with essentially half a game killed it for me.